Max Cooper's innovatory take on electronic music packed out the Metropolis stage at EM15. It was one of the few Friday night shows to attract a full crew of dancing patrons. From the outset, Cooper stayed away from the sentimental vocal tracks of his recordings, which is arguably his best material, but would have likely been ill-received at his 1:00 a.m. slot. 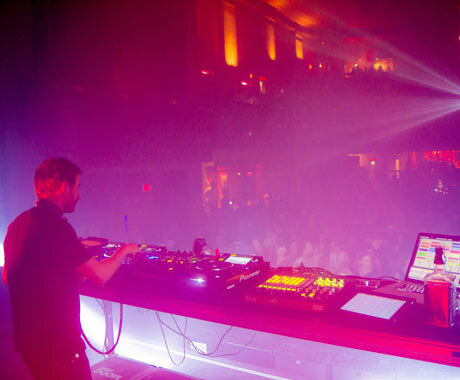 Instead, he set the tone for the night with club-driven songs like "Automation" and "Supine," combining these tracks with a wealth of vintage tunes, plucked from the last 20 years of electronic music. He even went so far as to throw in some anthemic drum & bass breaks from the early '90s dance era. After a short while, it was clearly evident that Cooper is one of the most talented acts around today. He's a veritable genius in terms of production, a fact that became incredibly obvious on the Metropolis speakers. At one point, the venue trembled under the subsonic onslaughts of "Potency," which were so sonically and physically intense that their departure left a gaping hole of confusion. After that, Cooper dove directly into dub-infused IDM of such high calibre than any lingering confusion was immediately transformed into stunned awe. A look at his back catalogue wouldn't lead one to believe that the U.K. producer could get so musically aggressive with his live show, but the zenith of his performance was filled with relentlessly hard techno. After his point was proven, he cooled things off a bit with the majestic "Adrift" before finishing the night with "Windowlicker," some outlandish jungle and ultra-detailed IDM. From start to finish, Cooper's EM15 performance was simply jaw-dropping and will be damn near impossible to top.